Krishna Reddy makes unusually stringent demands on viewers of his work. He asks of us a most difficult task: to approach his art without the very things that brings art to many, if not most, of the art public. As he has said and written, "The modern artist is miserably dependent on the dealer, the curator, the critic, and the media of publicity. He puts himself on a track to satisfy the passing fashions of the commercial world, where improvisation and interplay are mistaken for creativity. He designs his works of art to satisfy the tastes, desires, and needs of the market. But true creativity cannot exist where there is motive, ambition, and competitiveness." Think how we approach... read more. In our attempt to discuss art-making as a learning process it may be interesting to think about—and to some extent to explore—the interrelationship between mind and the Universe, which touches human life very closely. This subject deserves deep study and contemplation. We human beings, essentially dynamic processes, are of the Universe, which is a continuous changing process. We are... read more. Insect Intaglio, color viscosity 13 x 20"
Two Forms in One Intaglio, color viscosity 15 x 12"
Jellyfish Intaglio, color viscosity 13 x 17"
Pastorale Intaglio, color viscosity 15 x 19"
River Intaglio, color viscosity 13 x 18"
Whirlpool Intaglio, color viscosity 15 x 20"
Wave Intaglio, color viscosity 14 x 18"
Flight Intaglio, color viscosity 13 x 18"
Germination Intaglio, color viscosity 12 x 17"
Spider Web Intaglio, color viscosity 13 x 19"
Blossoming Intaglio, color viscosity 17 x 14"
Water Form Intaglio, color viscosity 13 x 17"
Demonstrators Intaglio, color viscosity 13 x 17"
Dawn Worship Intaglio, color viscosity 13 x 17"
Sun Worship Intaglio, color viscosity 14 x 17"
Rhyme Broken Intaglio, color viscosity 14 x 20"
Clown Juggling Intaglio, color viscosity 12 x 10"
Trapeze Intaglio, color viscosity 13 x 18"
The Clown and the Flying Swans Intaglio, color viscosity 14 x 20"
Clown Forming Intaglio, color viscosity 16 x 19"
Clown Dissolution Intaglio, color viscosity 16 x 12"
Violence and Sorrow Intaglio, color viscosity 14 x 19"
Woman of Sunflower Intaglio, color viscosity 14 x 18"
Seated Figure with Runner Intaglio, color viscosity 7 x 14"
Clown Dissolution Intaglio, color viscosity 13 x 19"
Native of Andhra Pradesh, India, Krishna Reddy, sculptor and printmaker, has devoted over half a century to teaching, public art projects, and exhibitions. Presently Professor Emeritus at New York University, Reddy was a faculty member of the College of Fine Arts, Kalakshrtra, Madras, India; Atelier 17, Paris, France; and New York University, New York, New York. His Visiting Artist and Artist-in-Residence commitments have spanned over 250 universities and art centers internationally. His creative endeavors have culminated in major retrospectives: in 1982, the Bronx Museum of the Arts presented Reddy’s new printmaking process and treatise, entitled New Ways of Simultaneous Color Printmaking, sponsored by the National Education Association, the New York State for Culture and the Arts, and the New York City Department of Cultural Affairs; in 1988, the Museo Palacio de Bellas Artes in Mexico City, Mexico, exhibited his prints, organized by the Institute of Fine Arts and the School of Fine Arts, University of Mexico, Mexico; in 1997 and 1988, the Printmaking Council of New Jersey presented Krishna Reddy: a Retrospective, in Somerville, New Jersey, and the Widener Gallery at Trinity College, Hartford, Conneticut, respectively; in 2004, the Manhattan Graphics Center honored Reddy in its Contemporary Prints of India exhibition in New York, New York. In 1999, the Chitrakala Paristha Art Center inaugurated a permanent display gallery dedicated to Reddy’s work in Bangalore, India. 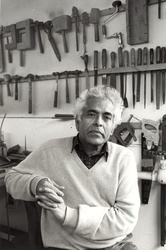 Most recently, in 2005, The Society of American Graphic Artists (SAGA) awarded Reddy the Lifetime Achievement Award for his accomplishments in the arts. Reddy’s public art projects include the monumental marble sculptures at St. Margarethan, Austria; Mont Royale Park, Montreal, Canada; Carrara, Italy; and at the Collectors Guild, in New York, New York. Aside from numerous one-man shows in Japan, New York, Yugoslavia, India, Austria, and the United States, his international exhibition record spans the globe. His juried exhibition record includes the National Academy of Fine Arts, New Delhi, India; the Society of American Graphic Artists at Parsons Exhibition Center, New York, New York; the American Color Print Society, Associated American Artists, Philadelphia, Pennsylvania; The Brooklyn Museum, New York, New York; Krannert Art Museum, Champaign, Illinois; ACIA Gallery, New York, New York; the Biennale of Tokyo, Tokyo, Japan; the Third International Biennale of Engraving, Museo del Grabado, Buenos Aires, Argentina; the Triennale of India, New Delhi, India; the Biennale Internationale de la Gravure, Krakow, Poland; the Commonwealth Printmakers, Curwen Gallery, London, England; the International Triennale of Original Color Graphics, Grenchen, Switzerland; the Beinnale of Paris, Paris, France; the National Gallery, Ottawa, Melbourne, Australia; the International Engravings Exhibition, Albertina Museum, Vienna, Austria; the Institute of Contemporary Arts, London, England; The Print Club, Philadelphia, Pennsylvania; the Cincinnati Art Museum, Cincinnati, Ohio; the Biennale of Venice, Italy; Musee d’Art Modernee, Paris, France; and the Biennale of Ljubijana, Yugoslavia.